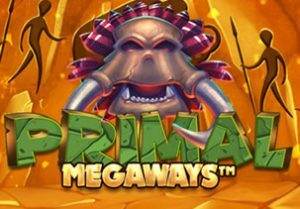 Go hunting for a mammoth sized jackpot in Primal Megaways, a prehistoric-themed slot game from Blueprint Gaming. This latest title to use Big Time Gaming’s shape-shifting game engine comes with a cracking bonus round where you can win up unlimited free spins with wild multipliers that can combine to send payouts soaring. Play this volatile slot game on your PC, tablet or mobile from between 20p and £150 per spin. If you’ve never played a MegaWays slot game before, then you might find the set up a little unusual. The number of symbols that can land on each reel changes with each spin. This also alters the number of possible ways you can create a winning combination. If the reels expand to their maximum, there are 46,656 potential ways to win. Those winners are created by landing matching symbols on adjoining reels. The reels are made up of lower value A to 10 royal values plus 5 higher value prehistoric animals. The most rewarding symbol is the woolly mammoth which offers awards of 50 times your total stake if you land 6 in combination. Helping things on that score is the paw print which is the wild. The replaces everything apart from the skull scatter. The wild multipliers can land on reels 2, 3, 4, 5 and 6 only. Land multiple wilds in the same winning combo and they are combined. Say you land a 2x multiplier plus a pair of 3x multipliers the payout boost would be an impressive 18x. If you get a 6x wild multiplier on all 6 reels, you’ll benefit from a whopping 7,776x multiplier! Hope to see plenty of skull scatters too as they will add extra free spins to your total. Just 2 get an extra 5 free spins. You’ll receive another 10, 15, 20 or 25 if you see 3, 4, 5 or 6 skulls simultaneously. There’s no limit to the number of times you can re-trigger the free spins. The wild also transforms into a wild multiplier for even more winning potential. We’ve not always been wowed by some of the other slot games in the MegaWays series. The design has been a bit cluttered in some of them which proved quite distracting. Blueprint Gaming have got things right on the sound and visuals front here though. The base game action isn’t overloaded with extras but there’s enough going on to keep things interesting. It’s the bonus round where the best opportunities in this volatile slot game arise. If you enjoy high variance action, then Primal MegaWays should appeal. And if those wild multipliers combine you could end up with some mammoth sized action – up to 10,000 times your stake on every free spin.